An interesting team is getting back together for something new, and it’s worth noting. 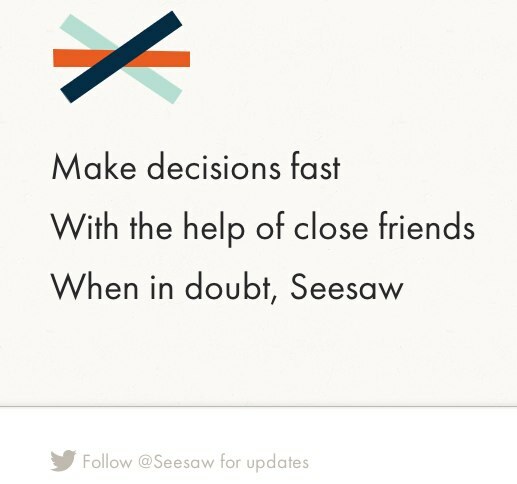 The founders of CoTweet, a company which was acquired by ExactTarget, is joining forces for a new startup called Seesaw. This time, Aaron Gotwalt is listed as CEO, and Jesse Engle will be heading business development. It’s a swap from the first time around with CoTweet. The pair are joined once again by Kyle Sollenberger. The company has already raised a seed round, led by Freestyle Capital. Baseline, First Round and Betaworks are also involved. Individual angels include Joe Fernandez, Hunter Walk and Desiree Gruber. Something to note is that all firms involved, other than Betaworks, were in on CoTweet’s funding. The amount of money raised was not disclosed. Not much is known about what the company will be doing as of yet, but there are currently five team members, including Sam Soffes, a brilliant iOS developer that previously worked at Scribd and Hipstamatic. Soffes still works on his task-tracking app called Cheddar. What we do know is that what the team is building is meant for consumers, which is a departure from CoTweet, which was built for enterprise customer service purposes. We’ll be keeping an eye on them as things develop. Hearing anything about what they’re working on? Hit us up at tips@beta.techcrunch.com.